These Gridwall Connectors Let Users Create Their Own Store Fixtures! Simple Screw Clips Attach Wire Rack Panels to Each Other! Order Gridwall Connectors in Bulk Online Today and Create Unique Retail Displays! Connects one wire rack panel to another with ease and security. 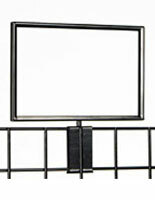 Can be used to create custom grid wall panel displays. Recommended installation for maximum fixture security is (2) connectors per panel. 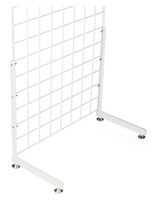 These gridwall connectors are invaluable accessories for creating custom retail displays using wire grid wall panels. Each of these dual hooks can be used to attach one wire panel to another. To ensure stability of custom store fixtures, we recommend using (2) gridwall connectors, also known as wire attachments, for each side of the intended fixture. Garment racks, retail displays, and free-standing wire rack constructions can all be easily created using this type of attachment. Attaching these rack accessories, gridwall connectors is very easy. Simply unscrew the connector and align the rack grid with the grooves. When screws are tightened the gridwall connectors will create a secure connection between panels. 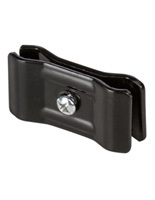 This black steel model will coordinate with almost all grid wall panels, and can be used for new installations in addition to use as a replacement for old or broken wire panel hooks. 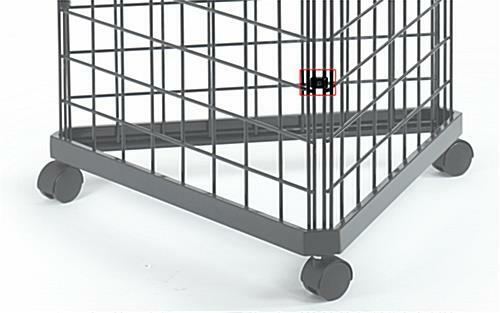 These gridwall connectors, also known as accessories for creating store fixtures, are very easy to use. Create custom retail store fixtures with ease by simply using these hooks to attach wire panels to each other. 0.9375" x 0.75" x 0.5625"